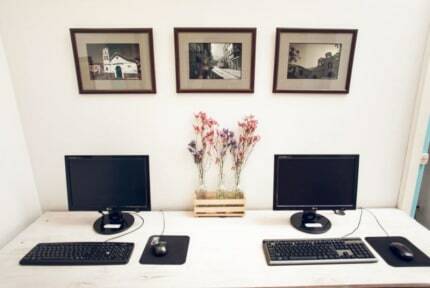 Hostel Casu, Bogota, Kolumbia : Rezerwuj teraz! Hostel Café Casu is a joyful and colorful place, located in the heart of La Candelaria neighbourhood in the historical centre of Bogotá (Calle 12D Bis No. 2-19). It is just 5 minutes walk from La Plaza de Bolívar (Bolívar square), the Luis Angel Arango Library, the Gold Museum, the Botero Museum and the entrance to the Monserrate. Nearby and in the surrounding areas, there are a wide variety of restaurants, banks, high street shops and craft and souvenir shops. 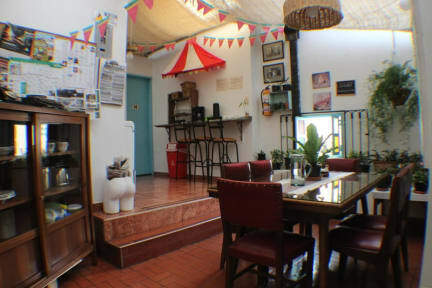 Hostel Café Casu sits just a few blocks away from several Transmilenio metro stations: Museo Del Oro, Universidades and Las Aguas. Our guests here enjoy the tranquility, comfort and cleanliness of our hostel. We offer only private rooms, for one or more guests. The rooms are decorated with vivid, colourful designs against a white backdrop, creating a fresh, cheerful and youthful aesthetic. La Candelaria is the colonial district is officially the first neighborhood of Bogotá. Colombia's capital city was founded here in 1538 by Spanish conquistador Gonzalo Jiménez de Quesada y Rivera in a spot known today as El Chorro de Quevedo. The next year, authorities re-founded the city a few blocks away at what is now known as the Plaza de Bolívar. Bogotá then grew up around the neighborhood. Because the city expanded west and north, La Candelaria retained much of its colonial atmosphere. The neighborhood is full of cobblestone streets and centuries-old houses. It is now a tourist attraction and university district, as well as the site of Colombia's government. Here you'll find most of the public buildings, both from the City and the Country's government. Historical squares, 400 year old churches, picturesque narrow streets are all to be found here, mixing with more modern developments in financial business district and you can find travel operators who offer city tours in Bogotá and La Candelaria. We are a hostel that offers private rooms with beds for one or 4 people in one room . The rooms are small or large with private or shared bathrooms and some with window to the outside in a special atmosphere, quiet and very cozy. We offer a comfortable and impeccably clean place to spend a stay.